You don't have to inherit a trust fund or run a business empire to become a millionaire. 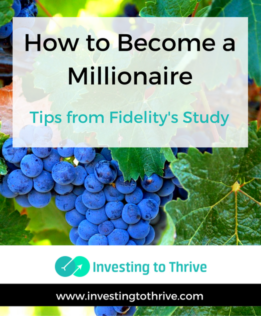 According to the 2014 Fidelity Millionaire Outlook Study, specific money-related behaviors can enable you to accumulate significant wealth, counted in the millions of dollars by the time you retire. The firm commissioned surveys of investors and advisors to identify steps to increasing wealth, which included drawing on investing-related habits of the emerging affluent (with $250,000 of investable and retirement assets at an average age of 40), mass affluent ($800,000 in assets), millionaires, and deca-millionaires ($10 million or more in net worth). Investing over a long time horizon is a key to accumulating wealth. Sure, making millions (or billions) on an IPO as business founder or investor sounds much more exciting and compelling than slowly building assets. But many people gradually grow their wealth over 30 or 40 years. For example, a 35-year-old with $200,000 (and not a penny more saved and invested) could accumulate over $2 million by age 65 if she earns an annual investment return of 8%. Though real life tends not to deliver predictable returns, steady growth often occurs over long periods of time. So, the earlier you start investing and the longer you stay invested, the more likely you can build a 7-figure investment portfolio. Notably, the wealthy represented in this survey focused on long-term investing. Get (and keep) a good-paying job. Those earning $125,000 annually tend to have a good opportunity to become wealthy. Though you could certainly save and invest on a lower income (particularly those who live in low-cost regions), having a relatively large income most likely improves the chances of accumulating a million dollars by retirement or earlier. For some folks, this income may be reachable while others not so much without significant changes career-wise. However, this news should be encouraging to many people. Contrary to what seems to be ever-growing popular belief, you don't have to construct a business empire before you are 30 years old or arrange your birth to royalty in order to become wealthy. I'll speculate about this finding in terms of cause and effect. Like me, you might reasonably conclude that folks become wealthy because they are willing to take risks. But I'll note that as investors accumulate greater wealth, they gain greater capacity to take risks because they have greater “disposable” assets (not earmarked for essentials). The wealthy often seek guidance and validation from financial advisors. And, deca-millionaires tend to consult more than one advisor. Forty-eight percent of the emerging affluent use an advisor whereas 70-71% of millionaires (and more) use these services. Getting help doesn't mean that you don't know what you are doing. It means that you don't mind paying for advice that could grow your wealth. More than 50% of deca-millionaires also held individual domestic bonds and real estate investments (such as real estate investment trusts but not including a primary residence). Further, investors held (in alphabetical order): alternative investments such as private equities and hedge funds; annuities; equity exchange-traded funds (ETFs); international mutual funds; international individual securities (including those in emerging economies); and managed accounts (e.g., separately managed accounts or wrap accounts). The big lesson for me from this survey and companion pieces at Fidelity's site: investing aggressively and constantly working to improve investing prowess may enable an investor to become a millionaire or multimillionaire.